In 1744, a workhouse was set up at Winster under the rule that "no persons shall be allowed any relief out of the house, unless in sickness or on some very extraordinary occasion". By the 1770s, the workhouse could accommodate 40 inmates. 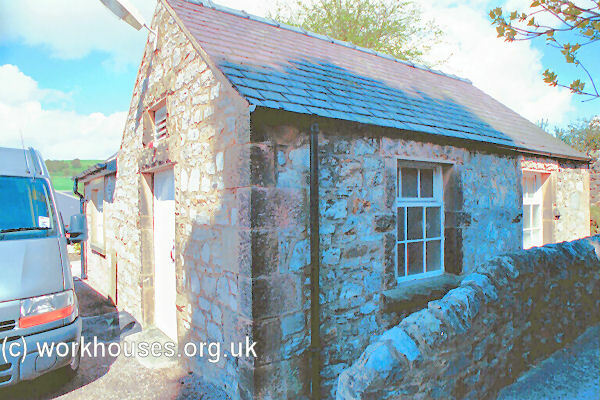 Winster's parish workhouse was located on Bank Top. 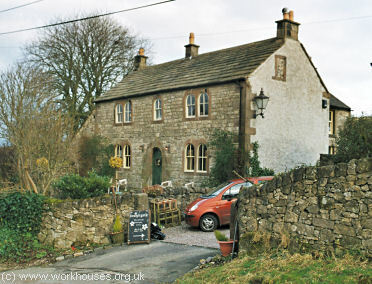 Winster former parish workhouse, 2005. A workhouse also existed at Hartington Middle Quarter which could house up to 70 inmates. County of Derby: Abney and Abney Grange, Aldwarke, Ashford, Bakewell (2), Baslow and Bubnell, Beesley, Birchover, Brushfield, Calver, Chelmorton, Cromford (2), Curbar, Darley Dale (2), Edensor, Eyam Woodlands, Flagg, Foolow, Froggart, Grange Mill (alias Ironbrook Grange) Gratton, Grindlow, Haddon Over, Halzebadge, Harthill, Hartington Middle Quarter (2), Hassop, Hathersage, Highlow, Great Hucklow, Little Hucklow, Litton, Great Longston, Little Longston, Matlock and Trusley (3), Middleton-by-Youlgreave, Money Ash, Nether Padley, Pillsley, Rowsley and Alport, Sheldon, Stanton, Stoke, Stoney Middleton, Taddington and Priestcliffe, Tideswell, Wardlow Miers, Wensley and Snitteston, Whestone, Winster. Later additions: Blackwell (1839), Bradwell (1839), Chatsworth (1861), Elton (1831), Nether Haddon (1861), Matlock Bath (1894), Offerton (1839), Outseats (1839), Rowland (1839), Tansley (1839), Youlegreave (1839). The population falling within the Union at the 1831 census had been 25,879 — ranging from Nether Padley (population 8) to Matlock and Trusley (3,262) and Bakewell (1,898). The average annual poor-rate expenditure for the period 1836-38 had been £6,392 or 4s.11d. per head of the population. 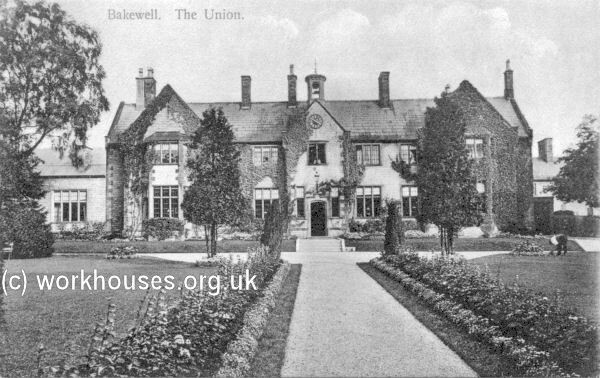 The new Bakewell Board of Guardians had their first meeting on 13th August 1838, at Bakewell Town Hall. The Hon. GH Cavendish was appointed Chairman. In October 1838, a sub-committee was appointed for providing a temporary workhouse. 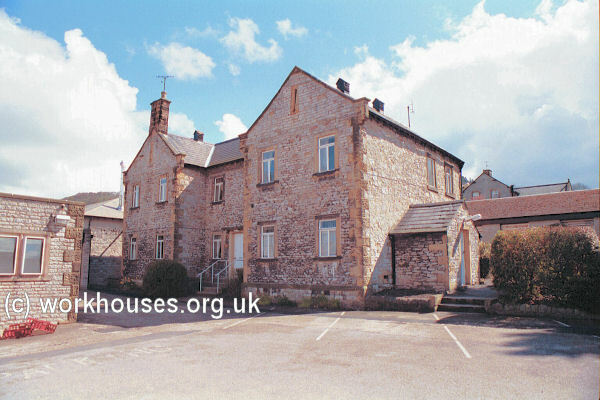 No suitable building could be found, and a private workhouse at Ashover was rented. In the meantime, the committee began considering the building in or near Bakewell. A four-acre piece of land at Newholme on the Bakewell to Sheffield Turnpike was purchased for £415 from the Earl of Carlisle. This was supplemented by a gift of land from the Duke of Rutland. Plans for the new building, which was to accommodate 200 inmates, were inspected from a number of architects including the well-know partnership of Scott and Moffatt. However, the design finally accepted was by a Mr Johnson of Sheffield. A building tender of £5,340 was accepted from the firm of Moses Hall and John White of Tean, near Cheadle. The bricks for the building were made locally from cast clay. A water supply for the workhouse was provided by the digging of a large pond which could hold 120,000 gallons of spring water. The building was completed early in 1841. Its location and layout can be seen on the 1920 map below. Two early views of the workhouse are shown below. A detail from the above shows what appears to be the workhouse porter and perhaps the master. 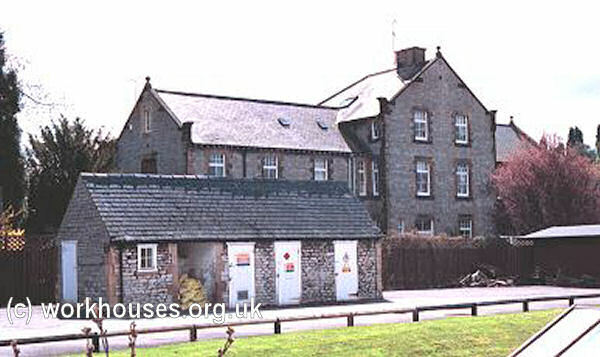 The main workhouse block was a Jacobean-style two-storey building. It was embellished with a turret clock and bell costing £80. 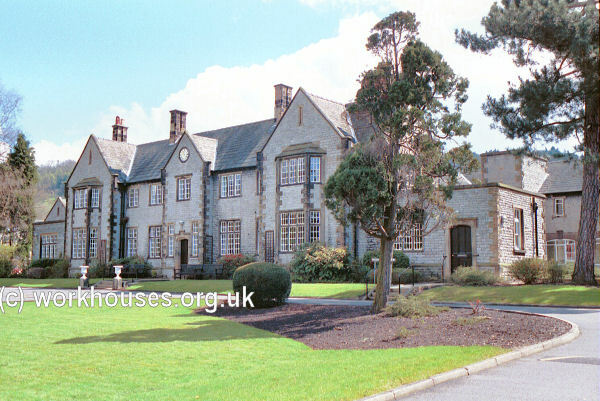 Bakewell main building from the west, 2001. In 1841, the ground floor of the main building's north wing was converted into use as a hospital. However, in 1848 work began on a separate infirmary block. 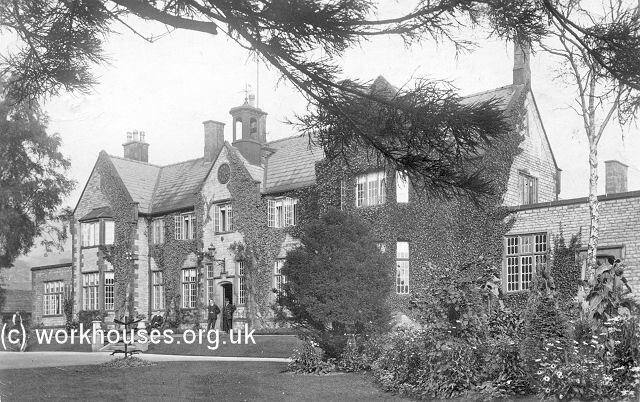 This two-storey H-shaped structure (later used as a nurses' home) was built immediately to the rear of the main building. It cost £444 and the work was carried out by a Bakewell stonemason. 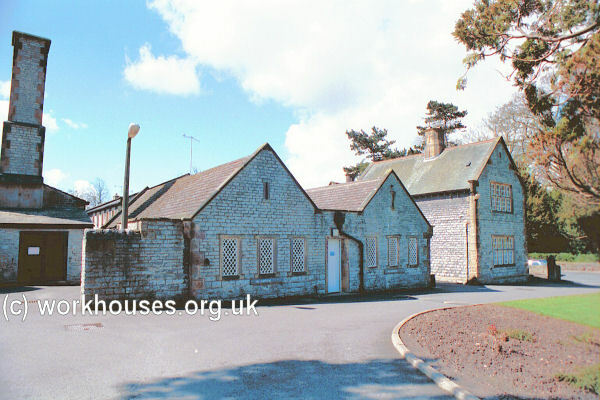 Bakewell original infirmary from the west, 2001. A new infirmary block, now demolished, was built in 1887-9 to the east of the workhouse. A larger infirmary block was added further to the east in 1899-1900. Bakewell 1900 infirmary from the north, 2001. A mortuary, probably built at the same time as the 1889 infirmary, was located to its north. A receiving block and casual wards were located towards the road at the south-west of the site. Bakewell casual block (left) and receiving block (right) from north-east, 2001. 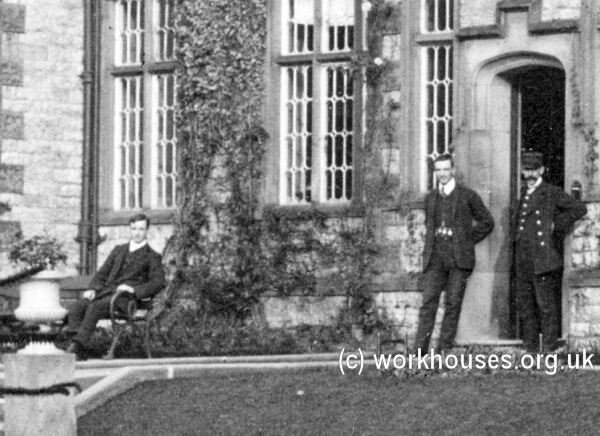 The workhouse later became known as Bakewell Public Assistance Institution and then under the National Health Service as Newholme Hospital. Derbyshire Record Office, New Street, Matlock, Derbyshire. Few records survive — holdings include: Guardians' minute books (1838-1930); Admissions and discharges (1896-7); etc. The History of our Hospitals (IV) Newholme Hospital Sheffield Regional Hospitals Board.